Do you need some holiday decor? How about something that's just easy, cheap and custom? 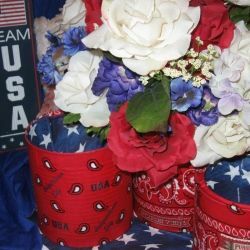 Wouldn't it be nice if the decor worked for Independence Day, Flag Day, Memorial Day, Veteran's Day and just summer in general? This does. I so love summertime. Everything is blooming and the fun of the Fourth of July festivities is just around the corner. I wanted to get some pots for new plants, not only for garden goodness, but to spread around for holiday fun decor, too. Like any normal, red blooded, American gal, I took off to go shopping. I returned with zero pots. That's right, not a one. Prices for the ones I liked ranged from twenty dollars to over forty, each. The frugal in me stood up and screamed, not a chance! Here's my DIY solution. For three medium sized planters, I paid zero, nothing, zilch, nadda even. Got to love it. Easy enough for the kids, stylish enough for moms. Don't waste your money getting matching planter pots. Be kind to the planet and let the kids have some patriotic type fun at the same time. It's so simple to do. All you need is a few things you most likely already have. I used some coffee cans, napkins, bandannas and stickers. Of course, the kids could do any color scheme or theme they desire. I wanted to stick with the stars and bars but the instructions will work for any style you can imagine. When the kids get bored and overheated this summer, use this fast, fun and frugal craft project to get them on the good foot helping the planet, learning about growing things and getting aboard the red, white and blue bandwagon. That's enough chatter. 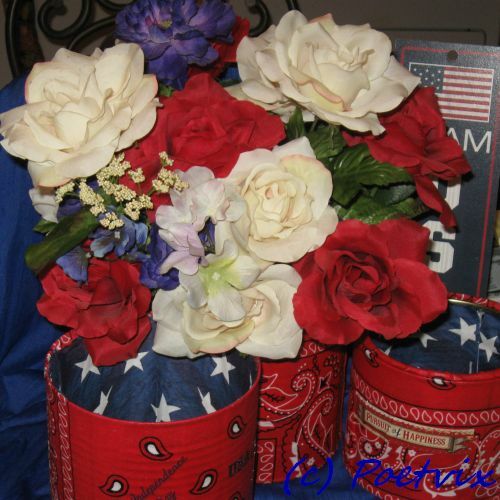 Lets make some matching DIY patriotic planters. Step One - Grab and cover. 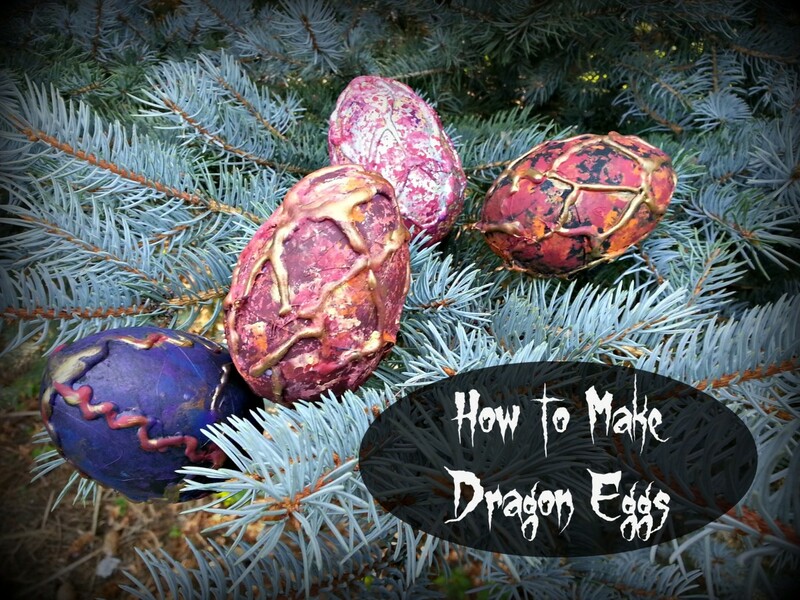 This is a great project to do outside. In fact, the last step has to be done outside. I did mine in the house because it was pouring down rain when I started. It would be more fun done outside and the kids could start planting right after the final coat dries. It doesn't take long. Right now, I'm waiting for the rain to stop so I can do the last step on mine. First off, gather your stuff and cover the surface you will be working on. 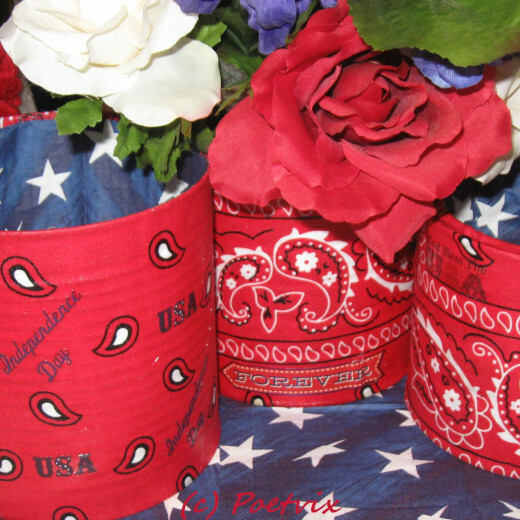 For this project, you will need three coffee cans or similar type containers, 1 bandanna, some stickers, napkins, a glue gun and glue sticks, Mod Podge and Spray on Acrylic and scissors. A grown up will be needed to make holes in the bottom of the can with a drill, punch, pick or even a screw driver and hammer. Stickers give tons of bling for the buck. I love stickers. They are fun but that's not really why I love them. Using stickers allows kids and those of us who are still kids at heart to get awesome looking art and graphics without having a ton of artistic talent. Stickers come in every color and design you can think of. For literally pennies, you can get enough to do multiple projects. Awesome! I like the old world look of these. It's a great themed collection that should, if you stretch it, cover about two to three coordinated pieces. From cards to mirrors, gift tags to mail boxes, there's almost nothing that can't be embellished with these awesome little sticky pieces of art. For kids, these are so much fun but for crafty type folks, they really can be useful once you get used to the idea. Step two makes it so the pot can drain. Step two - make holes in the bottom of the cans. 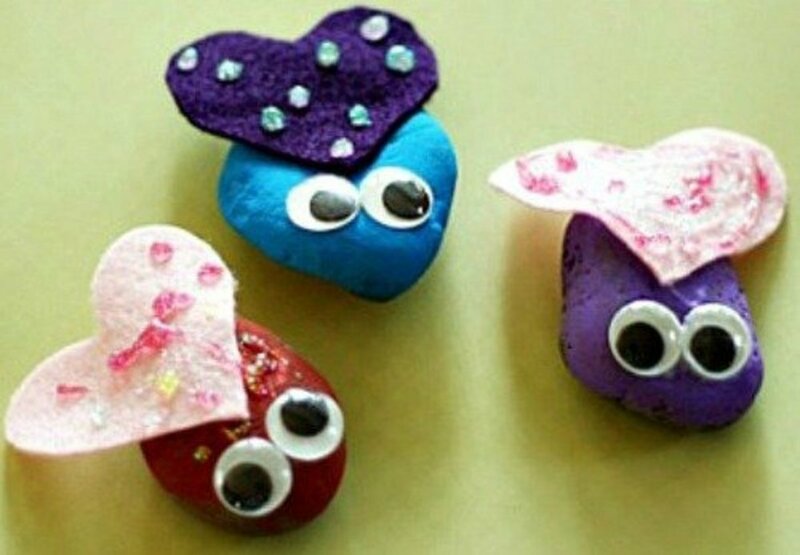 What's one of your favorite easy crafty mediums? Set up your space to start making the patriotic planter. Children should be supervised when using a glue gun until such time as moms, care givers and teachers know from repeated experience the child will use the tool safely on their own. 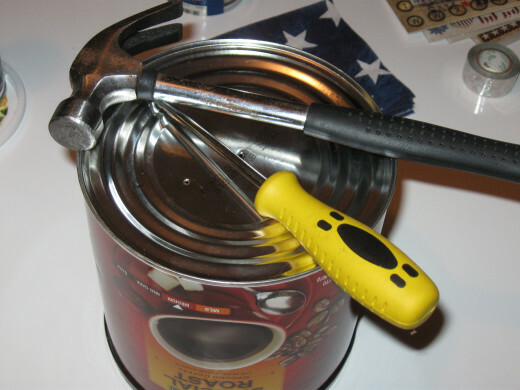 Using a hand drill, power drill or screw driver and hammer, make three or four small holes in the bottom of each can. IMPORTANT - Have an adult do this step. The metal when cut from drilling is super sharp! For older kids and adults, wear work gloves for this step just in case your hand slips. In the final step, we will be sealing the cans inside and out. But, if you want this to last for years without rusting, spray the inside of the can with Rust-oleum and let it dry before continuing the project. Step three gets the covering ready. 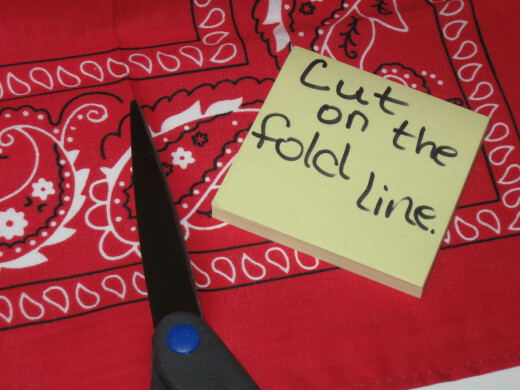 Cut the bandanna laterally along the fold line. 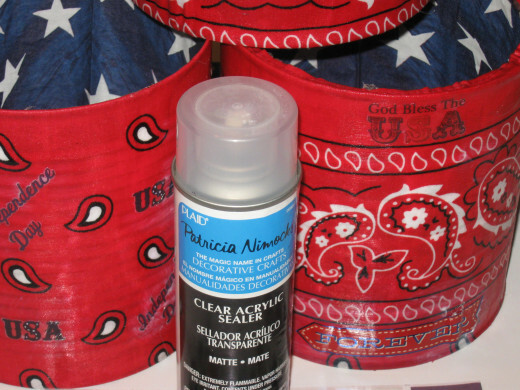 Bandannas come in the perfect size for covering most standard coffee cans. By cutting on the fold lines, you have enough fabric to easily cover three cans from one bandanna. Step four makes an ugly can go to pretty as a picture pretty quick. Tear the paper off the can and place in recycle bin. Because this paper is dyed, it is not suitable for composting. 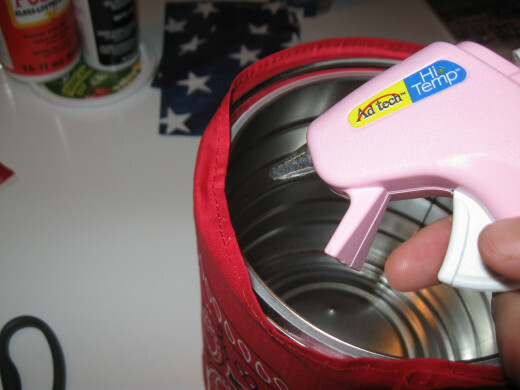 Using the hot glue gun, run a bead of glue down the side of the can. Carefully glue down the edge of your first bandanna strip. Wrap the fabric around the can. Be sure to leave some fabric hanging over on the top and bottom. Fold the loose end where you want to glue it. Glue down using another bead of glue right over where you started. Now, the can should be covered. Step five covers the rim. 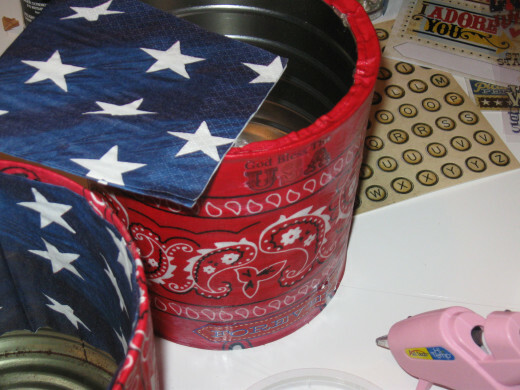 Fold over the extra fabric on the top of the can and glue it down to the inside rim. Be careful here. Some coffee cans, and other cans, come with a foil lining on top. When removed, sometimes little bits remain under the rim. They can be sharp. Inspect the can before running your fingers along the inside edge. Repeat the glue down for the bottom of the can. Stickers, stickers and more stickers. - Can you ever get enough? I can't. I know. I'm a craft junkie. I admit it. 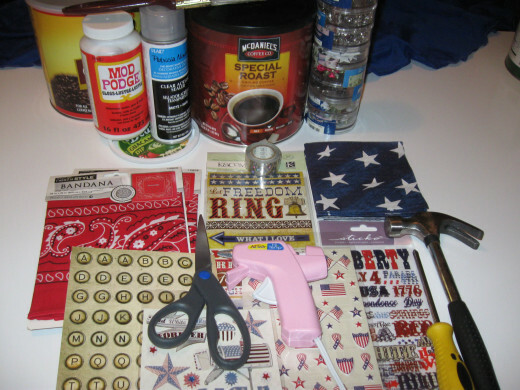 What kind of DIY patriotic projects would you like to try? Clothing and accessories. It's all about the fashion passion. Planters, pots, garden signs and all manner of outdoor bling. Red, white and blue food. Feed me, stars and bars style. Fun with flags, pendants, drape the yard and everything that won't run away. I love these large themed packs. One can get several projects out of a single pack, sometimes even more if you plan. This one stands up and screams Americana. It would be great not only for a project such as this, but also for scrapbooking pictures from patriotic holidays, bulletin boards for classrooms, even making your own party invitations. Step six seals it all up. It's time to break out the Mod Podge. 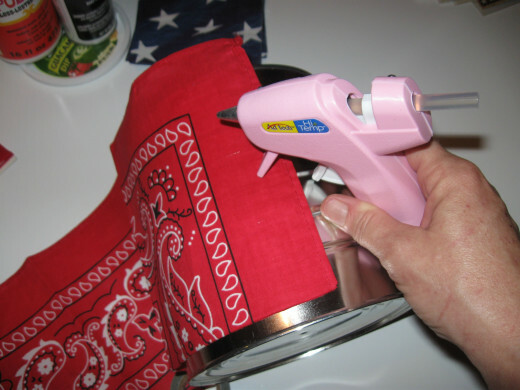 Using a paint brush, simply paint the product over the bandanna. It will look white and gross. Don't worry, it dries clear in about half an hour. Be sure to coat the entire thing really well. While it dries, take a break. Grab something cool to drink and start picking your stickers. Frugal tip - Do you want to help the planet and save mom some money, too? 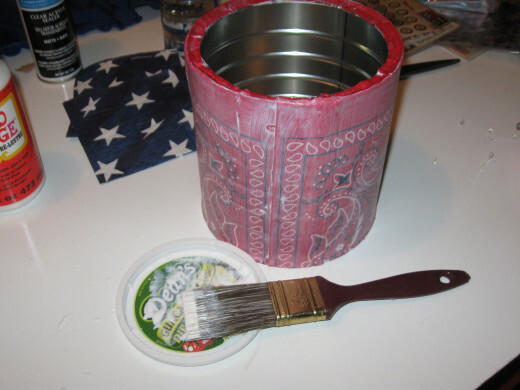 Use old lids from food containers to hold things like paint and glue during craft projects. Step seven brings out the stickers for the patriotic part of the planter. How far are you taking the Fourth? Throw on a tee shirt and wolf down a burger, baby. Maybe a decoration here and there, fun in the sun with the family. Rocking the block barbecue style. Stars and bars plates, napkins, the works. Food, fun, music, fashion, the yard, the house, do it all. We bleed red, white and blue. The sticker application is my favorite part. I got these stickers on sale at Walmart for less than one dollar last year for another project. I got the bandannas the same way. Be sure to save any stickers you don't use for future activities. TIP - If the stickers don't want to stick, use glue. Sometimes when stickers are old, they don't stick so well anymore. Just glue it down. We will go over the whole thing with sealant in the end, so you don't have to worry about any little edges that don't want to lay down right. Step eight - Hit it again! 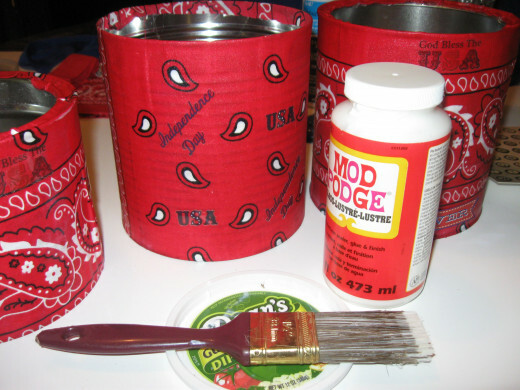 Use the Mod Podge to paint over all the stickers. Be sure to take it over all the edges really well. Be generous here. This will ensure things last over time and don't go peeling up whenever they want to. Step nine is to line the inside of the can. You could skip this step. When full of dirt and a plant, this lining will never show. Why do it then? It just looks better. It also allows for me to use this as more than just a planter. For instance, I'm using one out by the barbecue pit to hold Mr. Vix's tongs, spatula and other outdoor cooking implements. We are going to line the top of the can with napkins. To line the can, just run a thin bead of hot glue around the inside edge of the can. 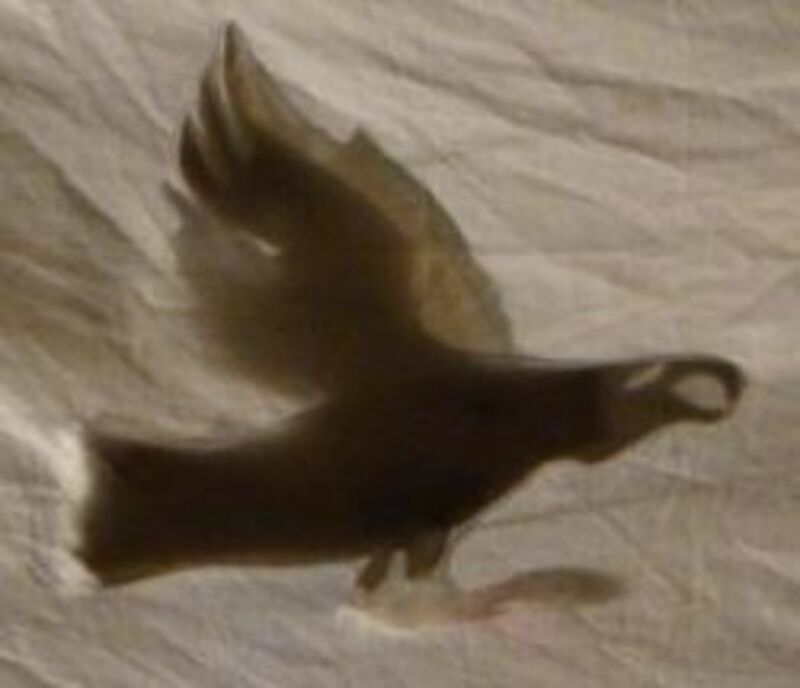 Glue the napkin down. Step ten applies another sealant to be sure it lasts. Finally, it's time to seal everything up. It's been fun, but I'm ready to get some plants going.This step has to be done outside. No matter what your can of acrylic says about using in well ventilated rooms with the windows open, trust me, go outside. You do NOT want to breathe this stuff. Spray the cans liberally inside and out, top to bottom. Wait a few minutes and do it again. Give each can at least two coats. Tips for working with spray acrylic - Be sure to spray in the direction the wind is moving so it blows away from you, not in your face. Wear a mask. Stay away from any kind of open flame. Scope out some fun videos that jam to get you in perfect patriotic mood. Oh, this is easy and fun to do. It's virtually mistake proof and easily customized to any color or theme. Why throw away perfectly good containers? Use this project to get a nice grouping of matching pots for pennies. Kids will have fun doing the project itself. Better yet, after it's done, the fun just goes on. Then, kids get to learn about nature as they watch their plantings grow. 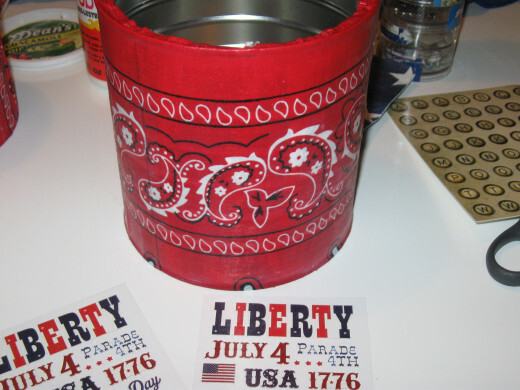 Be it for planting purposes or just some cool DIY storage for kid rooms, crafting supplies, outdoor cutlery or whatever you can think of, have some fun making a patriotic project this summer. What do you think about doing things DIY? Got any tips, tricks, ideas? What about plans for the Fourth? @georgepmoola2: Thank you :) I was looking at pots over the weekend for some new flowers. I ended up getting more red bandannas. I'm going to stick to this theme. @Heidi Vincent: Thank you. This one was fun but can you believe it's still raining? Seriously, it's been on and off for days! Poor little planters look naked waiting for the plants :). God bless and most happiest of crafting goodness. Another great DIY idea, poetvix! I love the way you find solutions that don't cost you an arm and a leg. @brianvallois lm: :) Me too!